This will go down as one of the greatest videos in history, and you must share it with everyone you know. It is one of the great achievements our species has ever done. SpaceX’s Falcon Heavy test flight was successful and the rocket’s upper stage, together with Elon Musk’s electric sports car Tesla and the dummy “Starman”, are on their way to Mars. When Falcon Heavy lifted off, it became the most powerful operational rocket in the world by a factor of two. This rocket that may one day carry humans to the Moon or Mars! With the ability to lift into orbit nearly 64 metric tons (141,000 lb)-a mass greater than a 737 jetliner loaded with passengers, crew, luggage and fuel-Falcon Heavy can lift more than twice the payload of the next closest operational vehicle, the Delta IV Heavy, at one-third the cost. Falcon Heavy draws upon the proven heritage and reliability of Falcon 9. You can watch the video of the Falcon Heavy’s spectacular test flight. Liftoff phase begins at 28:50. Following its first test launch, Falcon Heavy is now the most powerful operational rocket in the world by a factor of two. With the ability to lift into orbit nearly 64 metric tons (141,000 lb)—a mass greater than a 737 jetliner loaded with passengers, crew, luggage and fuel–Falcon Heavy can lift more than twice the payload of the next closest operational vehicle, the Delta IV Heavy, at one-third the cost. Falcon Heavy draws upon the proven heritage and reliability of Falcon 9. Falcon Heavy Test Flight: Liftoff. When the rocket lifted off, it became the most powerful operational rocket in the world by a factor of two. This rocket that may one day carry humans to the Moon or Mars! Side Cores landing. The heavy lift to orbit has been managed many times before. Electric cars – there are already three on the Moon. This, now: this is the stunning part. A perfect ballet of reusable rockets. SpaceX Falcon Heavy Test Flight was successful and the rocket’s upper stage, together with Elon Musk’s electric sports car Tesla and the dummy “Starman”, are on their way to Mars. Right in the middle of the car, on the center screen, are the words “DON’T PANIC!” It’s a reference to “The Hitchhiker’s Guide to the Galaxy”, the 1979 book that was first in a series by Douglas Adams about an accidental space traveler named Arthur Dent. In the series, Don’t Panic is a phrase on the cover of The Hitchhiker’s Guide to the Galaxy. The novel explains that this was partly because the device “looked insanely complicated” to operate, and partly to keep intergalactic travelers from panicking. “It is said that despite its many glaring (and occasionally fatal) inaccuracies, the Hitchhiker’s Guide to the Galaxy itself has outsold the Encyclopedia Galactica because it is slightly cheaper, and because it has the words ‘DON’T PANIC’ in large, friendly letters on the cover.” Arthur C. Clarke once said that Douglas Adams’ use of “don’t panic” was perhaps the best advice that could be given to humanity. Elon Musk first read “The Hitchhiker’s Guide” as a teenager, and it’s still one of his favorite science-fiction series. Falcon Heavy Test Flight: Starman and Earth. Elon Musk’s Tesla Roadster is an electric sports car that was the dummy payload for the Falcon Heavy test flight in February 2018. 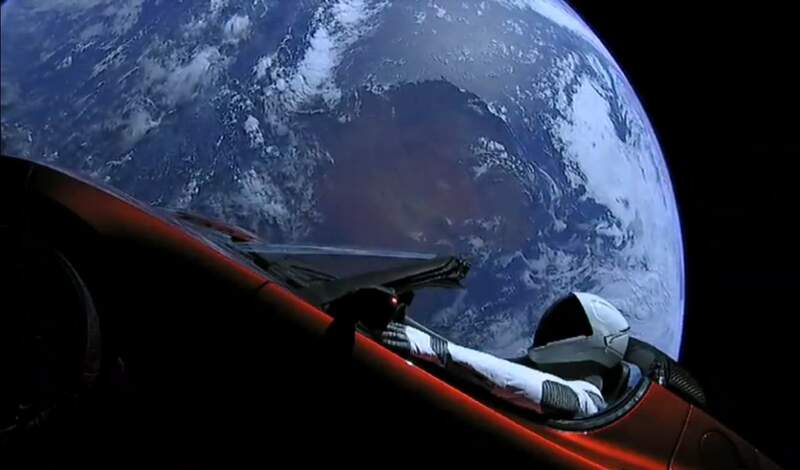 Starman, a mannequin dressed in a spacesuit, occupies the driver’s seat. 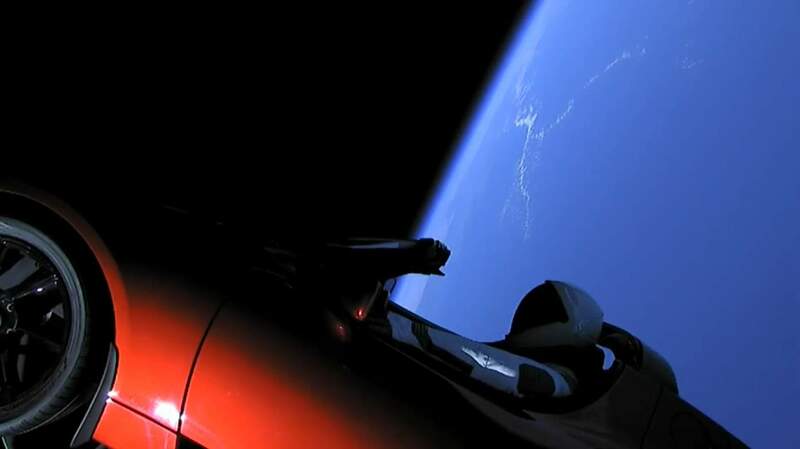 The car was installed in the Falcon Heavy rocket at an inclined position above the payload adapter in order to account for the mass distribution. Australia, you look good from here. Update: SpaceX has confirmed the Falcon Heavy’s upper stage has completed the second of three firings needed to escape the bonds of Earth’h’s gravity. The final Earth departure maneuver is planned more than 5 hours from now.